in Residential Institutes & Educational Societies of Telangana State. 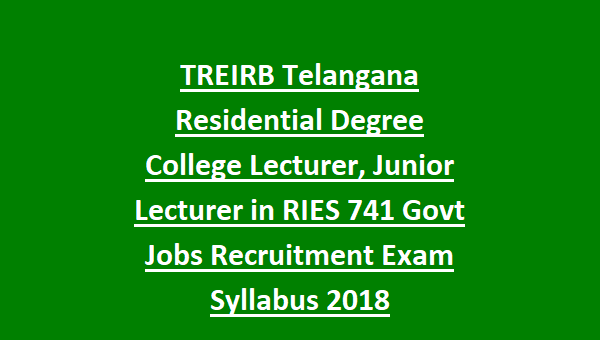 There are 465 Degree College Lecturer and 281 Junior Lecturer Jobs in Telangana State TREIRB Recruitment 2018. Selection for these Degree College Lecturer and Jr Lecturer Jobs will be based on Preliminary Exam only. Online applications for this TREIRB Degree College Lecturer Jobs will be accepted from 08-08-2018 to 13-09-2018 @www.TREIRB.telangana.gov.in. 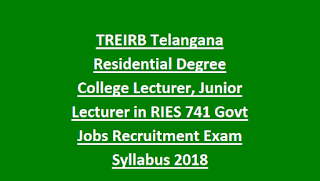 For more related information such as exam pattern, qualifications, syllabus, age limits, salary and other details about TREIRB Lecturer Jobs in Degree Colleges and Junior Lecturer Jobs are given below. There are total 741 Degree College Lecturer and Junior College Lecturer Jobs in Telangana PSC Recruitment 2018. For Lecturer, Junior Lecturer Jobs age limits are 18-44 years as on 01-07-2018 and 5 years of upper age relaxation for reserved category candidates. For Degree College Lecturer Jobs-Candidate must have qualified PG in relevant subject and NET or SLET or PH.D qualification is required. For Junior Lecturer Jobs-PG with at least 50% of marks and B.A B.Ed or B.Ed or B.Sc B.Ed is required. Selection for this Degree Colleges recruitment will be held based on Written exam and followed by Interview. Exam will be held for 200 marks. Total 2 papers will be given. Prelims Exam Pattern: Preliminary Exam will be conducted for 150 Marks and exam duration is 150 Minutes. Eligible qualifications having candidates can submit their application form online through www.tspsc.gov.in. Last date for submission of application form online for this TSPSC Degree College/Jr Lecturer Jobs is 13-09-2018.